Stunning setting for a bite to eat! 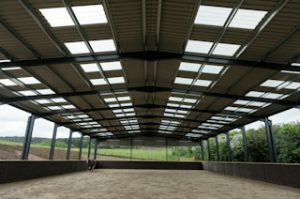 Have you been to see us yet in our stunning new equestrian centre? And if not, why not? Come and see what everyone is talking about! Our regular riders are enjoying state of the art facilities and ranch-style comfort and new clients are here every week to savour a taste of ‘Apres Horse’. We are also attracting lots of non-riding visitors who are calling in to take a look. It’s now a few weeks since the visitors’ centre was opened and we are happily settled in. 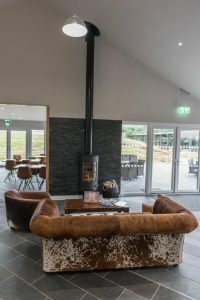 Our bistro is buzzing at weekends as our riders enjoy tasty food and drinks after an invigorating trek on the Chase, and there is a lovely cosy feel now that the log burner is blazing on chilly autumn days. As you all know, I have been planning this for such a long time and it is everything I hoped it would be. 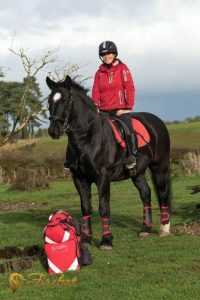 Sometimes equestrian centres can feel a little bit cold and offhand, but our treks now feel like friends going out for a ride on my horses and coming back to my place for a coffee. And from a health and safety aspect, we are now in a much better place. The check-in area is well designed and efficient, riders can gather without feeling they are getting in the way and we have lovely bathroom and hand-washing facilities. The horses are close and in full view but there is no danger of people accidentally straying among them. Now we are busy planning lots of new activities. 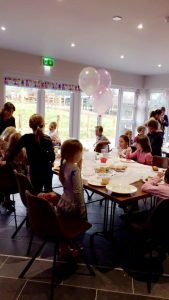 Our function room is already booked for an FPOS first-responder training course and is available for meetings, conferences and children’s birthday parties. 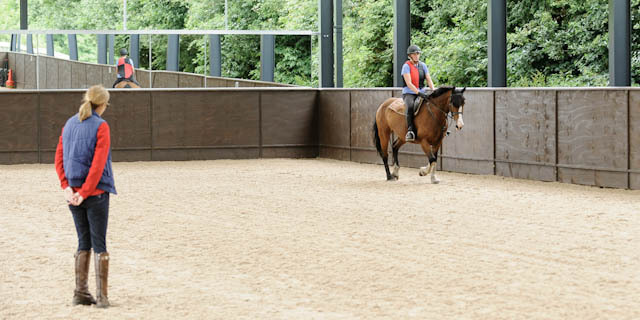 The indoor arena is open three days a week for lessons and children’s pony club. Quite a lot of clients are combining lessons with treks. And I’m thinking of organising a ‘pony club’ for adults too. That could be a lot of fun with a tasty supper in the lodge afterwards! Another of my ideas is to trek very early on summer mornings. We can ride out over the Chase to spot the wildlife in the quiet and beauty of the dawn and then return for a well-earned breakfast. Or how about an evening barbecue ride? That could be great for people who work full time. They could come straight to us and enjoy a ride before a lovely meal. We have so much to look forward to as we head towards 2017. Come and enjoy it with us. 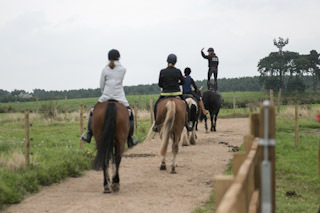 https://www.cannockchasehorsetrekking.com/wp-content/uploads/2016/10/relax_and_unwind_apres_horse.jpg 427 640 CCTC https://www.cannockchasehorsetrekking.com/wp-content/uploads/2017/11/cropped-icon.png CCTC2016-10-26 15:11:492017-11-23 12:28:21Stunning setting for a bite to eat! 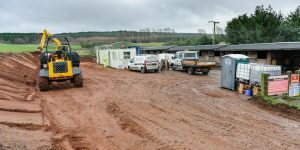 When I gave up modelling for a career with horses, I dreamed of establishing an equestrian centre that would bring visitors flocking to my beloved Cannock Chase, a designated Area of Outstanding Natural Beauty. 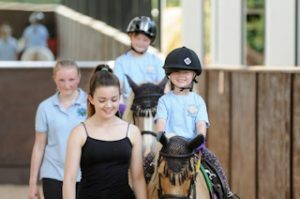 Since establishing Cannock Chase Trekking Centre, we receive around 17,000 visitors per year, all enjoying the beauty of the Staffordshire countryside on horseback. Now, 21 years later, I have taken my dream to the next level with the opening of a unique architect-designed cedar lodge offering a touch of ‘après horse’ for all visitors to the Centre. 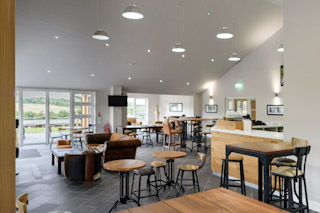 The lodge, which includes a ranch-style bistro and coffee shop with seating for 70 and meeting / conference room facilities, is part of the first phase of a major redevelopment of the horse trekking centre. 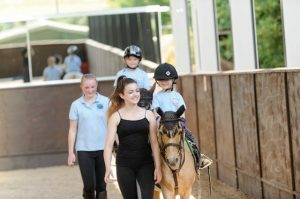 It was always my vision to make horse riding accessible and enjoyable for all and to provide a unique experience, and now that ambition is coming true and it’s very exciting. This has been years in planning and I can hardly believe that I am there! The visitor centre is absolutely stunning. I always had a clear picture of what I wanted it to look like, but the real thing exceeds that vision. As far as I know there is nowhere like it in the country. Maybe I’m biased but it really has the wow factor and this has been confirmed by the feedback from the many visitors already enjoying it. It has a beautiful coffee shop area with floor-to-ceiling glass offering panoramic views out to the Chase. 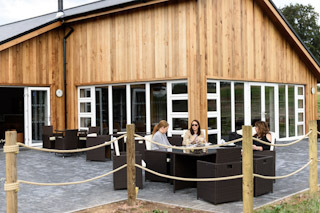 The lovely outdoor seating area mirrors those views and our visitors are able to see the horses coming and going on the treks. We have installed a log burner so it is all cosy on cold winter days. I have incorporated into the design a conference area and that is already attracting a lot of interest from organisations looking to use it for sales conferences and corporate team building events. 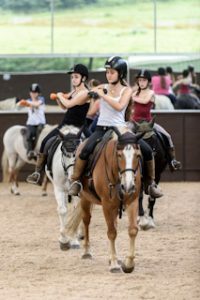 We are also looking to offer a unique twist on fitness with exercise classes on horseback. The ability to offer a variety of coffees sourced locally and provide a tasty and interesting menu means that visitors have a really pleasant experience. And, of course, all our riders have been really looking forward to ending their treks with a hot coffee and a piece of delicious home-made cake! 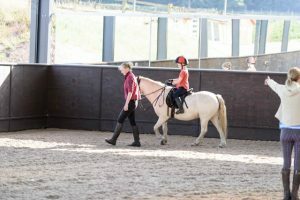 A huge indoor arena has also been built to facilitate – for the first time since the trekking centre was established in 1995 – riding lessons for all ages and abilities and a BHS registered instructor is already at work and proving very popular. 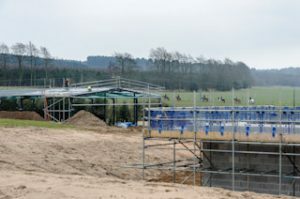 Phase two of the development will include an American-style barn with stabling for 46 horses complete with laundry facilities. 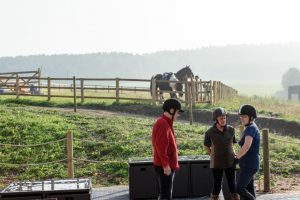 Of course, the core of the trekking centre will always be our rides across Cannock Chase, but this development means that we can offer a whole new experience to our visitors and enjoy a shared passion for horses. 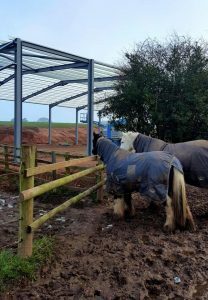 What a surprise I had when I returned home from a few days away to discover we now had the complete framework of an indoor arena, the first building that will be complete for our new equestrian centre! I just can’t believe how quickly it went up – there was nothing there when I left. 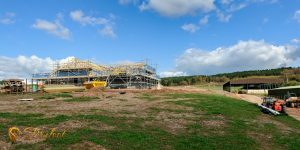 The blockwork started on the visitors’ centre and quickly grew up to floor level. 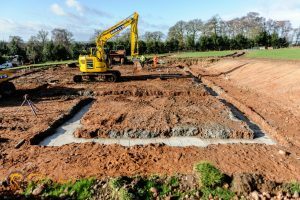 The sub base was laid and we could now clearly see how the layout will look when the building is complete. It also gave us a good impression of the surrounding outside area, which visitors will be able to enjoy too. 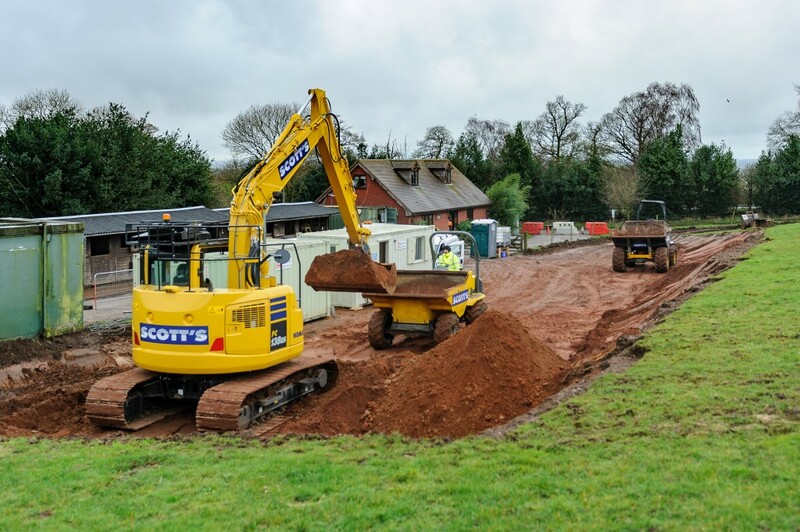 The septic tank was also installed and the team started laying the drainage around the visitors’ centre. This was the week when the magic happened! The crane arrived to lift the arena’s steel supports into place. We were told it would fly up once the work started, and the builders were right about that! From start to finish the whole process took just three days and there it was, perfectly timed for my return home. 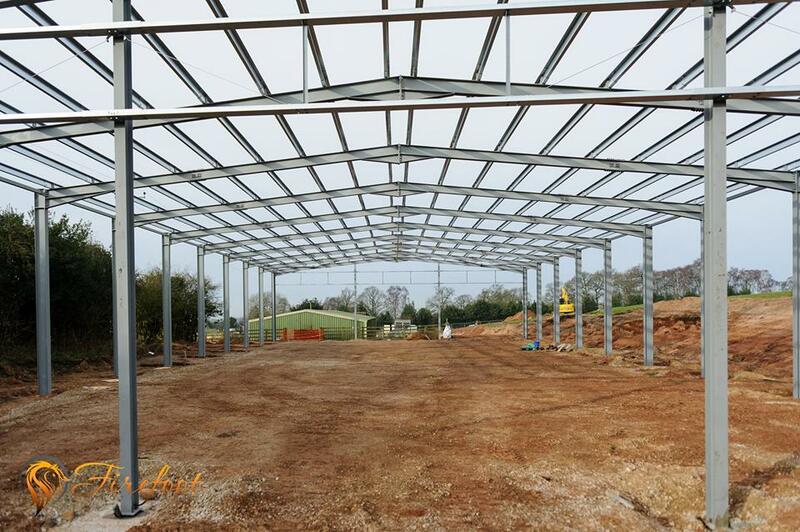 It’s all ready for the cladding and the roof to go on in two weeks’ time. 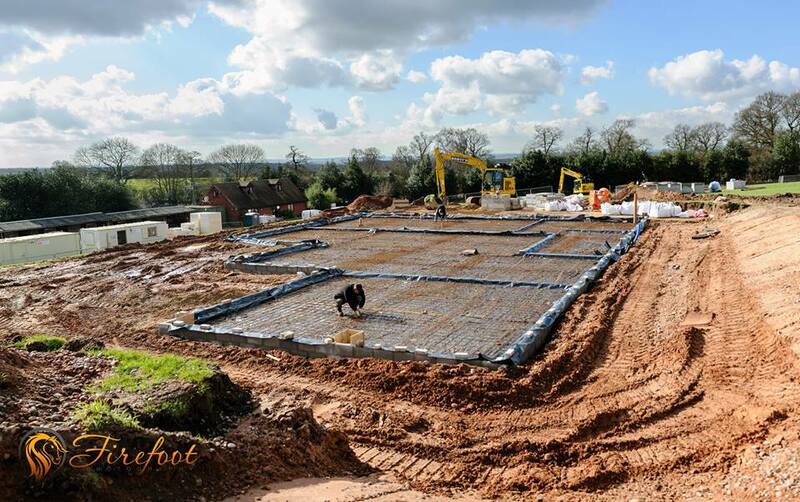 There was more progress too on the visitors’ centre, with the concrete cast for the floor. And outside the car park area started to take shape with the ground levelled off. No big dramas this week, just nice steady progress. The crew finished all the drainage around the visitors’ centre and then continued with the block work so that the walls are continuing to grow. Then it was on to painting the steel framework in the arena, so the primer and a couple of protective coats went on. We can’t wait to see what changes weeks seven and eight will bring. I keep saying how delighted I am with the way our lovely horses take everything in their stride, but they have really been exceptional lately. They were not worried in the slightest by the sight of the crane swinging the steel beams into place for the arena. Some of them were, in fact, setting off for a ride while the work was at its busiest, and were totally chilled out about the whole thing. And later we caught sight of a group of them peeping over the fence to have a look at it. Perhaps they were imagining themselves cantering around in there. They are just amazing – I’m so proud of them. It’s The Dawn Of A New Era At The Trekking Centre! Well, the great day is nearly here! After all the days, months and years of dreaming and planning, we are about to start work on our wonderful new trekking centre. All we need is a confirmed date from our builders and the first bricks can be laid. I can hardly believe it and I am so excited. For the last few years we have had lots of dreams for the centre. After 20 years here I felt that we were either going to have to downscale or really up our game. The facilities are getting a little tired now and after much thought we decided to go for it! 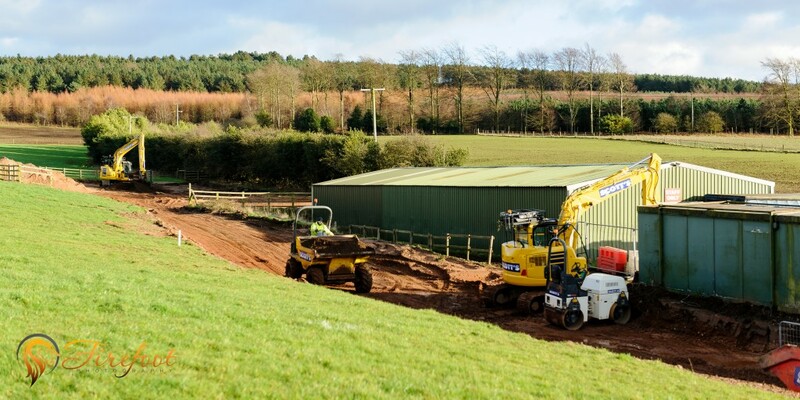 We are putting into action a plan for a whole new equestrian complex. We obtained planning permission and now, this month, ground can finally be broken. 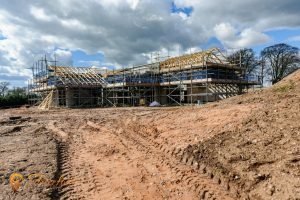 The new centre will comprise a visitors’ centre containing a contemporary coffee shop, a training and conference area, toilets, showers and a shop. 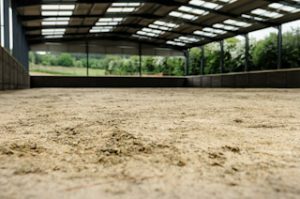 A brand new indoor arena will complete the first phase. 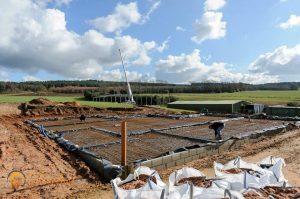 The second phase will include 46 new stables with wash areas, laundry rooms, tack rooms and foaling boxes. The visitors’ centre will be built of cedar wood and glass with a lovely viewing area. We see it as a relaxing place to come and we envisage all sorts of activities going on there. We will be able to host hen parties, birthday parties, well being days, corporate days and a retreat centre with a holistic theme. Food and drink will be healthy – but we’re planning a few naughties as well, especially as my mum is a cake designer. You can be sure there will be some delicious treats on offer. We’re also planning kit hire and merchandising and we’re looking forward to organising some pony club evenings. There will also be a medical room and myself and the staff are undertaking our training to become a first responder horse unit. We felt we needed to be self contained following the closure of the A and E Unit in Stafford. The development will give us the chance to offer all sorts of fun activities, including breakfast rides and evening barbeque rides. I’ve never intended to provide formal lessons because there are a lot of excellent riding schools in the county. 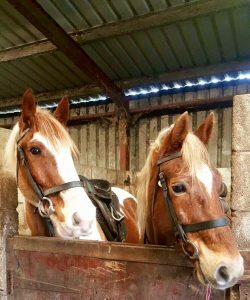 But we have a lot of clients who would like to push themselves a little further with the horses they love and trust, especially our younger riders. So we have some exciting plans for unconventional activities that we hope lots of clients will enjoy. This is such an exciting time in the history of our centre. The future is looking really bright – come along with us for the ride! https://www.cannockchasehorsetrekking.com/wp-content/uploads/2015/04/blog1.jpg 1363 2048 CCTC https://www.cannockchasehorsetrekking.com/wp-content/uploads/2017/11/cropped-icon.png CCTC2015-04-30 15:26:222017-11-23 12:25:47It's The Dawn Of A New Era At The Trekking Centre!